1515 Saint Catherine Street W.
On July 10, the AMO will present a live stream of the AI Now Symposium. Please join us in the EV building, room 11.705, for what promises to be a fascinating and vital discussion of the far-reaching effects of artificial intelligence. In addition to the live stream, this event will provide a networking opportunity for anyone in Montreal who is interested in the social and political consequences of AI. The event is free and open to the public; space is limited. Light refreshments will be provided. Developing Audience Insights: What Does It Mean for a Public Broadcaster? Driven by a desire to better serve their audiences, the adoption of user data management tools is now a firmly established practice for virtually all publishers of online content.The first in the AMO’s series of discussions about the mutual influence of algorithms and culture, Stephane Caron (Senior Director of Business Intelligence at Radio-Canada) will present an inside view of Radio-Canada’s ongoing efforts to develop new ways of collecting and analyzing online user behaviour data. Caron’s presentation will provide a unique opportunity to gain insight into the technical and ethical challenges of incorporating emerging data science practices while developing protocols to protect user privacy—all while adhering to Radio-Canada’s public service mandate. 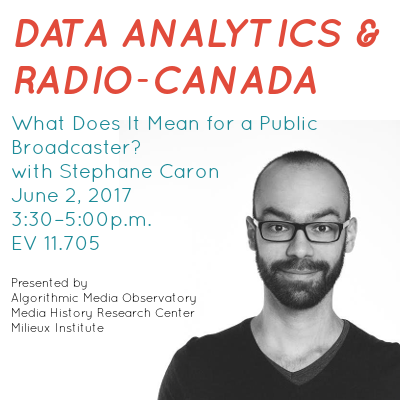 Caron will discuss his team’s work implementing a data management platform, designing predictive models for user behaviour, using machine-learning algorithms, and creating a content recommendation system that encompasses Radio-Canada’s wide range of cultural productions, including their extensive historical archives.Followed by a question-and-answer session, Caron’s talk will explore the connections between ethics and engineering, privacy rights and personalization, and data and design. The presentation will also give students in Computer Science and Communication Studies the chance to meet a potential employer and learn how Radio-Canada is extending its mandate in an era of big data, machine learning, and algorithmic recommendation. This event is organized by the Media History Research Centre and the Algorithmic Media Observatory with the generous support of the Milieux Institute for Arts, Culture and Technology.